Today I have a card set to share with you. 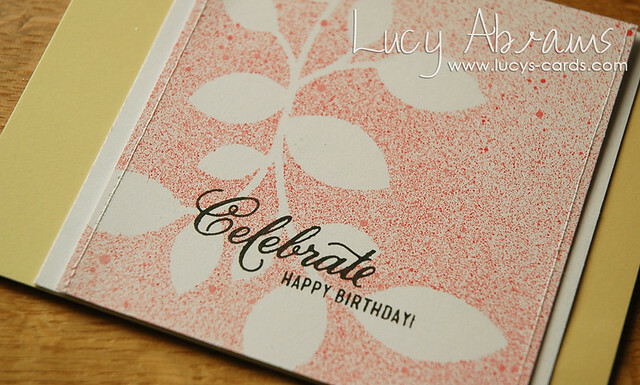 It's a set of 5 cards - all different but all sharing one same focal design - the new Clustered Leaf die, Stencil and Mask from Simon Says Stamp's Valentine's release. 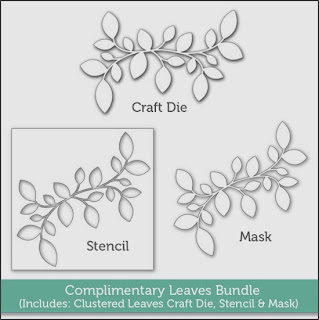 And best of all, when I told the lovely folks at Simon that I had made this set, they created a special offer meaning you can now buy the die, mask and stencil as a package for just $19.99 (to buy all three separately would be $31.97!) I just love the Simon folk. I made the set as a Christmas gift for my Mother-in-Law, so chose a pretty, floral colour scheme with lots of yellow as she loves yellow. The main colours are Hero Arts' Carnation, Daffodil and Shallows. 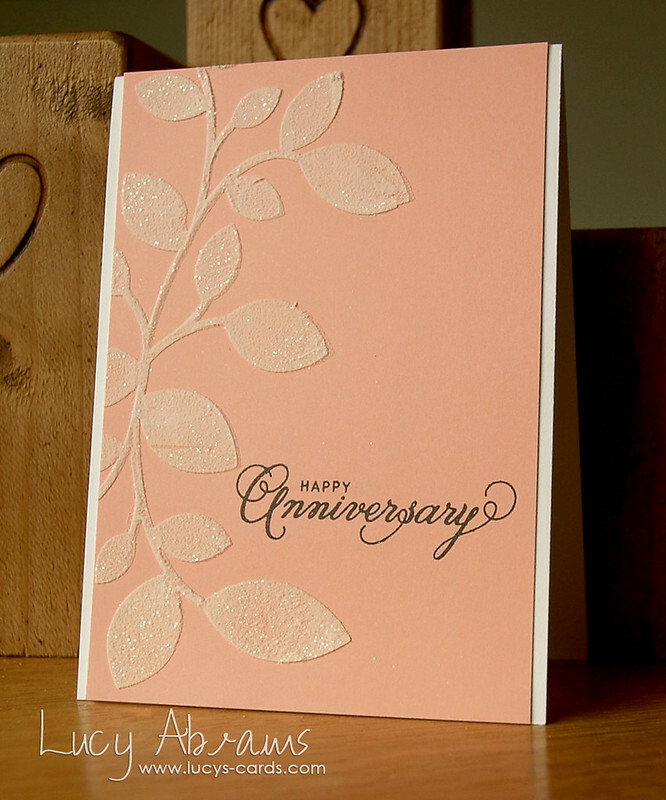 I kept the sentiments simple, using the new Perfect Love stamp set. I added the Happy Birthday from the From Us set. Rock Candy Distress Glitter gives such a soft shimmer. It's so very pretty. 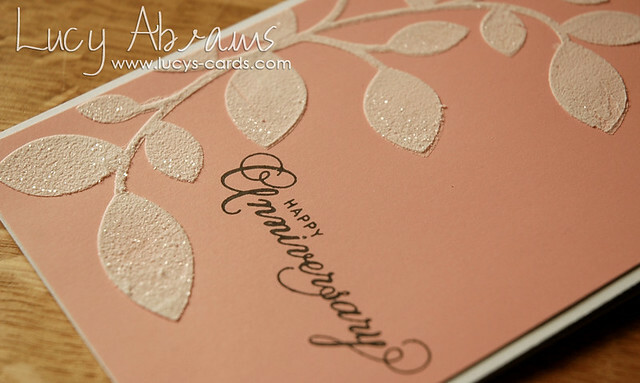 Next, a shimmery Thank You card. 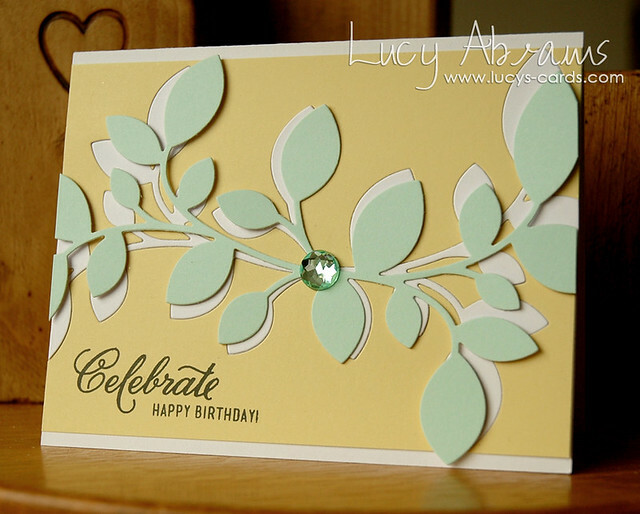 For this one, I die cut the Leaves from Shallows paper then added LOTS of Calico Shine Mister Huey's. Next, I used the Mask. I taped the mask to some white card stock, then sprayed it with First Kiss Mister Huey's. For this card I used the Leaves die again. First I die cut the leaves from Daffodil paper, then again from white and Shallows. 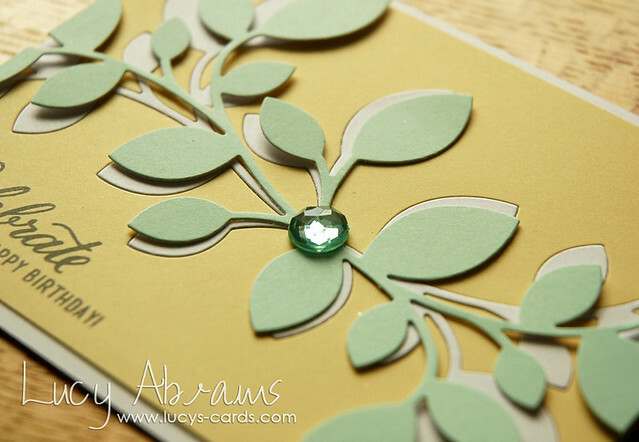 I adhered the negative of the Daffodil die to a Hero Arts Snow notecard, then slotted the white die cut into the negative space. Finally, I adhered the Shallows die cut on top but at an angle for a bit of visual interest. 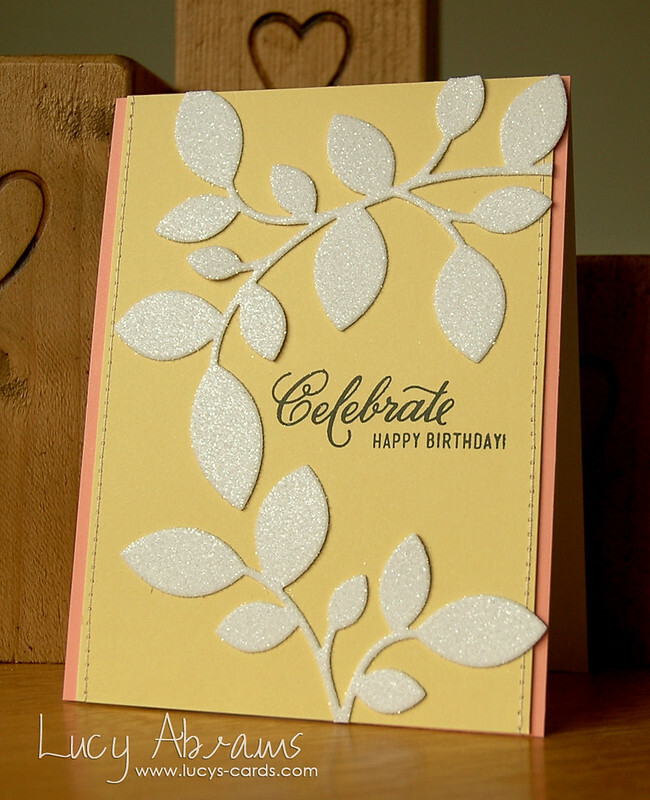 I added a gorgeous Doodlebug jewel to the centre of the card. And that's it. I packaged them into a clear box and added a simple ribbon. I hope she'll like the set. I always feel a bit funny about giving handmade gifts, even though they take a lot more thought and preparation than store bought stuff! I hope you enjoyed seeing some of these fab products in action. Congratulations to Simon Says Stamp on an awesome release. I love the new products and hope I get more time to play, even after our imminent arrival!! Bye for now. Back soon. Very very good. I only just found your website and it is inspirational. Extremely well done and we'll designed cards. Beautiful Lucy. I love all the different techniques and ways you have demonstrated the versatility of this product. Awesome job. They are lovely Lucy ... I think I know what I am buying for my birthday .. 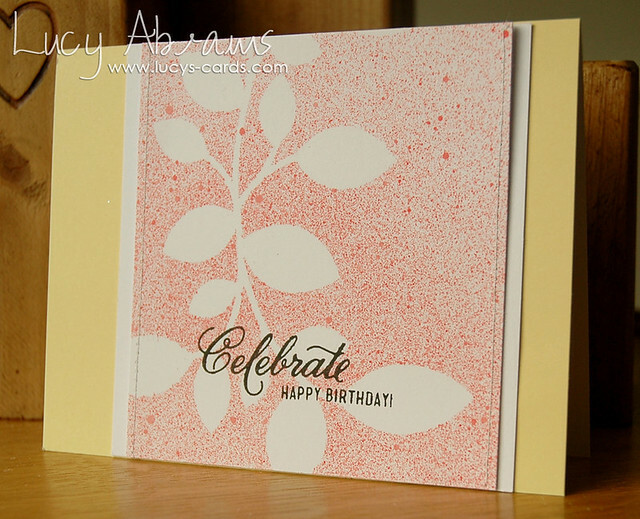 I love using dies , punches and stencils when making my cards . Absolutely awesome Lucy! 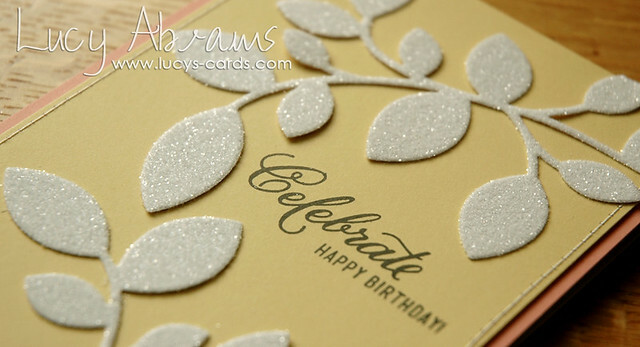 The leaves are possibly my favourite from the new release and you have just made them shine! 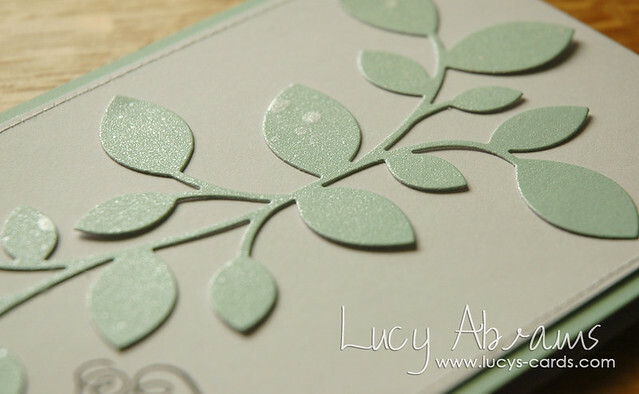 I just love these simple designs so the gorgeous leaves can take centre stage! Love what you created Lucy - they are all fabulous. wow--you really did a lot with a simple piece! Gorgeous cards! What a great set! I know this is an older post, but wow! I just purchased this die and I thank you for the wonderful inspiration!